Because he’s clearly the unsung hero of the Rick and Morty series and people can’t get their hands on Pickle Rick fast enough! To say that Rick and Morty is already a cult classic is an understatement. People are lining up all over the country just to see the Rickmobile visit their town. As if this Adult Swim cartoon (ahem, genius cartoon) couldn’t get any bigger, we were all recently introduced to “Pickle Rick” on August 6, 2017 (during season three) and he instantly became a major fan favorite. 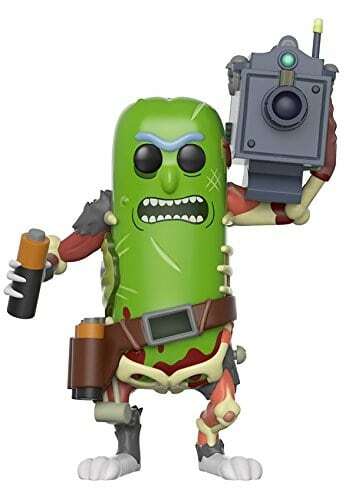 In the end, Pickle Rick is turned back into just plain old regular Rick (thanks to Beth’s syringe), but either way people immediately became obsessed with all things ‘Pickle Rick.’ Shop our picks for the best Pickle Rick merch, action figures, and more. Get ’em while you can!